There you are, on a gorgeous sunny day, just trying to relax and soak up some rays… when sand starts itching it’s way onto your towel. Kids and dogs running by, or just moving around to get comfortable seems to add more sand into the mix. I guess you just have to deal with it, right? Nope! The military’s got you covered. Kind of. 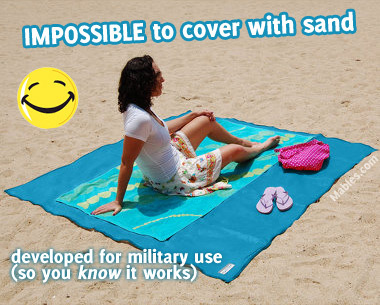 This technological marvel called the Sandless Beach Mat was indeed developed by the military for landing a chopper and not blowing sand every which way. 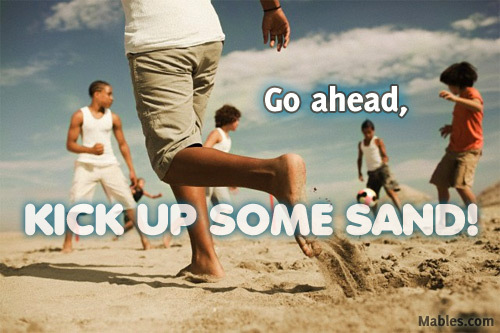 Now you can use this technology to spend an awesome day at the beach, connecting with nature, while staying comfy, too. This sandless towel also eliminates dirt, dust, and water from its surface, so you have a perpetually clean outdoor space. Perfect for camping or watching outdoor concerts. What, you need features? Well, it’s also strong enough to resist abrasions from outdoor furniture or pets, the towel will remain flat, and it never absorbs moisture, so it can’t grow mold or mildew. Having your very own trampoline in your front or backyard guarantees that you are one of the cool kids on the block. Surround that trampoline with a lake, and suddenly you’re a baller. This epic water trampoline is also Guaranteed for Life! So if you and your friends get a little crazy and pop it, you get a replacement. Awesome. The entire trampoline’s diameter is 12 feet, but the durable nylon jumping surface is a safe 6 feet in diameter. The trampoline is made of the same heavy duty materials used in life rafts and tow-ables and includes a detachable ladder and anchor. “You bring the drinks, and I’ll bring the hot tub,” is the start of a beautiful night Knowing you have a Lifetime Guarantee makes it all the sweeter. This portable hot tub will inflate in ten minutes with the included motor and will filter your 250 gallons of heated water with the included pump system. Heat is controlled by a built in control panel so you don’t even have to get out of the spa to adjust it. You and three of your friends can relax comfortably on the cushioned walls and soothe those tired muscles with the heated jet action that’s comparable to permanently installed hot tubs. It’s also constructed of the same epic vinyl found in white water rafts that are meant to prevent punctures and tears in rough rocky rivers. All you need is a hose and a space big enough to fit an 82 inch hot tub o’ fun, and you are stylin’ in no time. It’s getting to be that time of year when it gets cold at night, and I think a nice dip in this heated hot tub would be the hit of any party or just a great end to any day. Are You Worthy of a Chair Fit for Royalty? When was the last time you truly felt like royalty lounging in greatness? Maybe it was your well worn Lazy Boy chair at home or maybe it’s your $4,000 massage chair labeled “The World’s Most Advanced Massage Chair.” Or maybe you just can’t remember that far into your past lives? Well, relax I’m here to show you how special you really are. You deserve a a chair built for a king, and a queen. That’s right, both you and your fellow majesty can fit comfortably in this over-sized stadium style chair. Stadium style meaning; you are towering over those peasant sized chairs the normies use. And I know you, you are worried about your “help” getting hurt transporting this colossal chair for you. Well don’t fret, it comes with a duffel bag to make it easy to carry. 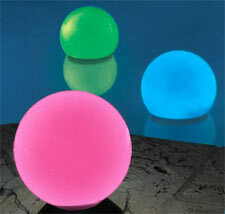 Plus it’s portable for all those outdoor sporting events you so effortlessly grace with your glowing presence. The lifetime guarantee lovers over at Hammacher call this the The Brobdingnagian Sports Chair, but we just call it awesome. Let’s take a look in the “oh oh oh! gimme gimme, I neeeeed it, I’m sure” category. Here we are: A $30,000 humongous three dimensional spherical labyrinth aptly titled “The Superplexus”. Check it out. It’s large, 36 inches in diameter, and holds a hand made wooden track longer than a football field if laid out flat. The object, like other labyrinths, is to roll the marble from one end of the track to the other without falling off the track. I particularly admire the “complex network of chicanes, multi-planar hairpin turns, spirals, and staircases–even a vortex.” Wow a vortex! I’m stoked already! More importantly I saw a tie-in with autistic/spectrum kids when I read ” … [this] challenges the limits of your manual dexterity and spatial understanding …” from Hammacher. This relates to how Google has found that “people with autism tend to be visually and spatially gifted” from their SketchUp 3D software. How’s that for awesome? I say let’s all buy one right now! Plus Free Shipping on orders over $99 at Hammacher Schlemmer with Code: FEBSHIPS – Limited Time Offer What are you waiting for? Hammacher Schlemmer just released their new product catalog for Spring 2008 and it’s got lots of people in a tizzy due to it’s sheer awesomeness. For those of us no longer using outdated technology like a printed catalog need to visit their site out for the sweet items. Inside the catalog, i-Sobot stands out from the crowd since being recognized by the Guinness Book of World Records as “The smallest humanoid robot in production” and Hammacher has it at the lowest price available online. Watch the video on their site to get a taste of the robot’s impressive skills like a 200 word vocabulary, 180 programmed movements, and witty responses to verbal commands. On the more extravagant side of the spectrum is a – perfect for summer – Single-seat Water Cycle, priced at a whopping $2,999. Basically it is a recumbent bicycle strapped to a funky kayak that can go up to 7 MPH (as fast as an Olympic swimmer, and faster than most paddle boats), as well as a lifetime guarantee from Hammacher. Get yourself in a tizzy. Looking for top quality noise cancelling headphones? Act now and receive a free MP3 player with the purchase of a pair of Bose Noise Cancelling Headphones from the ever reliable Hammacher. You get to choose between 2 styles of headphones; around the ear headphone design (cups the ear), or on-ear design (rest on the ear). Used by travelers to reduce aircraft engine noise, and by others preferring tranquility in their work, these Bose headphones are renowned for their full-spectrum noise reduction and comfortable fit. Both styles feature tiny microphones inside the ear cups that identify unwanted sound and a correction signal prevents the noise from reaching the speakers, ensuring external noise reduction. This special offer includes a free MP3 player that has voice recording, voice playback capabilities, and comes preloaded with 38 songs. Hurry, as this offer ends June 30th 2007. Get up to 50% off at Hammacher Schlemmer’s private online sale. Why is it called a private sale? Because they don’t have any links to it on their own site. You have to be lucky enough (that’s you!) to find the links elsewhere. We’ve blogged about why bamboo fabrics are so desirable before and now their bamboo sheets are on sale at almost half the regular price. Be aware that these have limited quantities, and when they’re gone, the sale is over. Another item worth mentioning in their private sale is the iPod t-shirt with built in iPod pocket and headphone tunnel. Great for those who want to listen to their music while they work out and not have the earphones or MP3 player get in their way. Looking for something to foster more creativity in your kids than video games and movies? So are we, and that’s why I wanted to share this three sided art and activity center with everyone. Instead of placing a regular easel against the wall, where it would be easily ignored, I’d place it in the middle of the room, or slightly away from the walls in a corner. That way it can’t be thought of as another piece of furniture, but an actual activity center. When they are bored, or feeling artsy, this will call to them with it’s three different mediums for expression. One dry erase board, one chalkboard, and one drawing board with mounted roll of paper for easy access will provide them with lots of opportunities to draw by themselves or with friends. Recommended for ages 3 and up. Great as a gift for another parent, or for your own kid. Act now to take advantage of Hammacher’s sale price and save $50. Shop smarter with Hammacher’s unconditional lifetime guarantee.